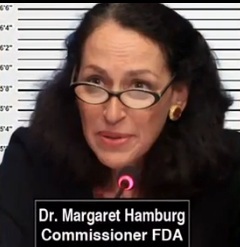 A YouTube video apparently in support of “Project GreenLife” superimposes an image of FDA Commissioner Dr. Margaret Hamburg against the backdrop of a height chart — an apparent bid to suggest that Hamburg should be booked at a police station. The PP Blog first told you about “Miracle Mineral Supplement,” also known as “Miracle Mineral Solution” or MMS, in August 2010. The FDA warned that serious harm could come to human beings who consumed it, saying MMS produced industrial bleach when used as directed. “Multiple independent distributors” sold the product online, the FDA said. Now, the U.S. Department of Justice has announced that four people — two from Oregon and two from Washington state — have been charged criminally. Named defendants were Louis Daniel Smith, 42, and Karis Delong, 38, both of Ashland, Ore. Also charged were Chris Olson, 49, and Tammy Olson, 50, of Nine Mile Falls, Wash.
“Our most vulnerable citizens need real medicine — not dangerous chemicals peddled by modern-day snake oil salesmen,” said Stuart F. Delery, principal deputy assistant Attorney General for the Justice Department’s Civil Division. Smith and Delong operated a business known as “Project GreenLife” or PGL, the Justice Department said. Pro Advocate Group reportedly was the Texas-based entity that assisted the AdViewGlobal HYIP scam form a “private association” in 2009 in which AVG appears to have tried to insulate itself from examination by the U.S. government by purporting to operate from Uruguay. In April 2012, federal prosecutors in the District of Columbia linked AVG to the $119 million Ponzi scheme operated by Andy Bowdoin of AdSurfDaily. Along with hawking purported private associations, Pro Advocate Group claims on its website that it offers “Pro Se Litigation with Super Appeal” and other services. A Justice Department news release yesterday on the charges flowing from Project GreenLife and the sale of MMS did not reference Pro Advocate Group. Smith, Delong and Tammy Olson were charged with one count of conspiracy, four counts of interstate sales of misbranded drugs and one count of smuggling. Chris Olson was charged with one count of conspiracy, one count of the interstate sale of a misbranded drug and one count of smuggling. Research by the PP Blog shows that Daniel Smith apparently has supporters who’ve issued an appeal to “Please take a stand to help save MMS and Daniel Smith from the FDA.” A headline for video on the site describes the FDA as a “Cult of Tryanny.” A narrator describes the FDA as a “rogue agency” and superimposes the images of FDA Commissioner Margaret A. Hamburg and others against the backdrop of a height chart. It appears to be a ham-handed way to suggest that Hamburg and the other purported “rogues” should be booked at a police station. As part of the scheme to manufacture MMS, the indictment alleges that Smith, Delong, and others smuggled sodium chlorite into the United States from Canada using fraudulent invoices to hide the true end use of the product. In these invoices, according to the indictment, they falsely claimed that the ingredients they were purchasing for MMS were to be used in wastewater treatment facilities. According to the charging documents, Smith and Delong were the managing members of PGL Smith co-founded the company, and Delong frequently handled financial transactions for the company and recruited friends and family to participate in the business. The indictment alleges that Smith and Delong paid Tammy Olson to handle all customer inquiries regarding the product. It is alleged that Tammy Olson continued selling MMS on her own website after federal agents shut down the Project GreenLife website and production facilities. The indictment also alleges that Smith and Delong paid Chris Olson to clandestinely manufacture MMS in a building on his property after regulators from the Food and Drug Administration (FDA) inspected PGL’s original manufacture and shipping locations. The ProAdvocate Group did such a good job with AVG(A) and Andy Bowdoin !! I also noticed that Doctor Hamburg pictured above is over 6′ 6″ tall. What are the chances? WNBA material?? I also noticed that Doctor Hamburg pictured above is over 6? 6? tall.What are the chances?WNBA material?? And she was sitting down. After being involved in the wonderful world of Ponzi’s/cyber-crime for over 9 years I never dreamed that I would be seeing the things I am seeing now happening. People not only ripping off people with their Ponzi’s, but also willingly causing physical damage to a person’s health if not death all in the name of greed. There is no doubt we have a moral crisis in the US, and I never thought I would see this degradation of morals in my lifetime. Would you kindly give some examples where this has happened and peoples' health has been damaged. To my knowledge many thousands have been using this so it should be easy. Would you kindly give some examples where this has happened and peoples’ health has been damaged. To my knowledge many thousands have been using this so it should be easy. Really, you know of thousands of people who had been taking chlorine dioxide for “medicinal purposes”? Perhaps you can explain why OSHA labelled it poison and extremely volatile? Yes, I have used it myself and had good effects. And yes thousands of others. In any case, you have not answered my question. Give me evidence of harm where this product has been used. Health Canada advises that using this product as directed may cause serious health problems. Ingestion of water treated with Miracle Mineral Solution (28% sodium chlorite solution) has been associated with two adverse reactions in Canada, including one life threatening reaction. The U.S. Food and Drug Administration is warning consumers not to take Miracle Mineral Solution, an oral liquid also known as “Miracle Mineral Supplement” or “MMS.” The product, when used as directed, produces an industrial bleach that can cause serious harm to health. That is not evidence. In fact, just the opposite. It is obvious you haven’t gone beyond reading what is said there. You haven’t given one single example of anyone harmed, in spite of the fact that many thousands have been using this, including me. Mate, if you want to drink sodium chlorite, good luck to you. Others less prone to quack cures and conspiracy theories AND with some experience in these matters might like to disagree with you. I’ve a suggestion. Drink diet coke. It’s got aspartame in it, as do other soft drinks. The FDDA say it’s ok, after years of saying it isn’t. But changed their mind with the help of Donald Rumsfeld, who stood to gain millions from it. And lots more people die each year from the drug industry and did in the Vietnam war. Of course they are just conspiracy theories. (a term coined by the CIA) Good luck to you. You might need it. You really have nothing to help your scam. That thread has been active for about 4 years. I wonder if the reptile-aliens wash their space-suits in Miracle Mineral Supplement? I’ve a suggestion. Drink diet coke. It’s got aspartame in it, as do other soft drinks. The FDDA say it’s ok, after years of saying it isn’t. But changed their mind with the help of Donald Rumsfeld, who stood to gain millions from it. And lots more people die each year from the drug industry and did in the Vietnam war. Of course they are just conspiracy theories. (a term coined by the CIA)Good luck to you. You might need it. What is the “FDAA” ? Hardly an auspicious start for your investigative abilities there, John. how about instead of obtaining your “facts” from some obscure website, perhaps you’d be better advised to look into the FDA record on aspartame for yourself. Even IF (and, I do mean IF) the FDA had done a turnaround on its’ policy regarding aspartame, why would you take that one example to mean it’s wrong on sodium chlorite ?? Are you arguing the FDA warnings WRT drinking sulphuric acid must be wrong as well ?? I am prepared to listen to and respect other views. Of course it is dangerous to see quacks in the cases you mentioned. Even if a liscenced medical doctor offered me medicine, I would ask him to give me at least 10 testimonials of people who have done what he has suggested to see where it led them. However, in the case of MMS solution none of you have been able to provide a single case where someone has suffered detrimentally from using it as suggested in the protocols. I took note of many testimonials before using it at the time. I don’t think I have anything more to say on MMS. However, I do agree with Patrick in plastic surgery cases and others, that someone should always check. Even then, it is always wise to get solid testimonials, just as you would when looking for a dentist. The problem with quack medicinals packaged and sold as cures by unlicensed individuals who cling to the “private association” myth is the same as the problem with unlicensed medical quacks who inject patients in hotel rooms: the high prospect of harm to the patient/consumer. In the specific case of medicinals, consumers have been known to delay legitimate life-saving treatments because a huckster persuades them while they are deeply depressed from a legitimate diagnosis and battling denial that consuming a concoction will save their lives or eradicate a disease. IMHO, any person who placed any trust at all in the supply chain and manufacturing conditions of MMS were gambling with their health. The purported involvement of Pro Advocate Group makes it even worse. It appears very much as though MMS or someone associated with it used the “sovereign citizen” tactic of divining a construction by which the FDA had consented to a self-executing contract by not responding to a communication within 10 days. That kind of hogwash is right out of the Curtis Richmond playbook as evidenced in the ASD Ponzi case. It is never going to fly except in the minds of the purveyors. At a minimum, it is intellectual quackery if not outright extortion. Patrick I respect what you say. I don’t accept anything I think is quackery. However, before I trust anything I always check both sides and also want to see testimonials or any negativity. FDA Attacks Daniel Smith of Project Greenlife….because MMS is a bleach (or something like that) or because the Big Pharma pays off the officials so it doesn’t have competition from unregistered products. Well, I personally take MMS (also called water purifier, water purification drops, sodium chlorite, or chlorine dioxide) and I have killed many kinds of bacteria and parasites in my body. I sniff it into my lungs and it is killing off some kind of fungus I had that goes along with acid reflux and the stomach acid getting into the lungs when you sleep. No antibiotic can heal this lung condition because it is on the membrane of the lungs. My 84 year old husband is over Lyme Disease and sleep apnea because of taking these MMS drops. These drops are very inexpensive and almost free considering that a $25 bottle retail might last a year or two. The FDA attach is not about people making MONEY selling these drops — it would cost Millions and millions of dollars to do the Trial studies to prove that MMS is a drug. Greenlife hardly makes any money selling this product — they sell it for $10 wholesale. There is no money here! So per sale they might make $4 per person per year! No money here. Who is making money off drugs? Are these million dollar drugs safe? A new drug is worth a billion dollars to the pharmaceutical company. Follow the money and you will see where the problem is. Thanks for allowing me to share my opinion here! I ask that anyone who reads the following does so by first disengaging their emotions and then uses only their rational thought. I’m going to ask very important, rational questions that demand rational, not emotional, answers and that anyone taking or thinking about taking this stuff should definitely know. Now with that said, MMS is one of the stupidest things I’ve ever heard of. For starters, it’s clearly just another quack cure, because if it really did work, they medical industry would simply take it and use it to cure everyone. What sense does it make for people supposedly motivated by money to not immediately jump on the one thing that will make them the most money, ever? Believe it or not, the main reasons people avoid costly medical treatments is because they don’t think it will work and have no guarantee that they’ll get better! If you had something that you could simply charge 5 times as much for, that would actually cure someone, why wouldn’t you give it to them? People would offer all of their life savings to you if you could guarantee that they could continue to live. Believe me, if these supposedly super powerful people who are keeping all the cures from everybody really wanted to make the most money, and this stuff was real, they could just assassinate it’s creator and sell the formula in special treatment programs for millions. The fact that Jim Humble isn’t dead and we don’t have a bunch of new and experimental treatment options for diseases popping up that cost millions but can almost guarantee your health is an obvious testament that the conspiracy doesn’t exist. They would have simply killed him years ago. That’s just one of the problems with this, though. Does anyone really believe that doctors and nurses who go into medicine with the intention to HELP people, somehow, magically just get brainwashed and turned into the instruments of “big pharma” just because they went through a few years of college and hands on internship? Is the process of becoming a registered nurse or doctor really going to corrupt someone to their core to the point where they would pass up a miracle cure and let good people die just because they’re apparently blinded by profits? Not everyone who works at the hospital is rich, you know, and their job is really stressful and filled with chances of lawsuits and the likes. Why would anyone willingly subject themselves to this if they could just give someone MMS and take their money? Because MMS is a fraud and it’s never been proven to cure anyone, regardless of all the noise that people make about it. Be honest. How hard would it be to set something like the above up? Just find anyone with the title M.D who’s willing to hear you out about this stuff, then rent a hotel room or set up a room in someone’s house for these people to stay. Give them the substance exactly as it’s supposedly supposed to be taken and observe them as they “recover” from whatever ails them. You might be wondering why I’d choose the HIV/AIDS and terminal cancer patients for this study, and the answer is simple; it’s usually acknowledged that these are diseases that are life threatening and incurable and if MMS really worked, it should be able to save these people’s lives. Quite easily. According to it’s creator, it’s apparently already done all of this before. Now it’s time to put it’s money where it’s mouth is. Put it to the test. Obviously, you could do a little screening (like in all clinical trials) to find people who aren’t quite at death’s doorstep. For example, someone with liver cancer that spread to the rest of their organs who will die within a year would be perfect, giving you plenty of time for this MMS stuff to work it’s magic. This would eliminate the chances of the patient being too far gone for MMS to have made a difference. These are all fair and completely ideal situations for MMS to be tested and to do real good at the same time. These people already aren’t going to get better. You know they’re going to die. So there’s only three outcomes; nothing happens, they get worse, or they’re completely cured. But we already know what will happen, and so do the people who are involved in marketing this quack cure. You can completely avoid all of the expensive testing of MRI scans, Xrays and the like if you only stick with the AIDS/HIV patients, since you can just have them tested again. Your test subjects most likely have health insurance that would pay for the tests (or some of the costs at least) so you wouldn’t even have to pay the full prices. Truthfully though, lets not pretend that there aren’t charities that would be willing to front all of the money for this kind of research. If it was the real deal, people would be jumping at the chance to help out and be a part of the solution to man’s biggest threat; diseases. Be realistic, if MMS actually worked, it would be the greatest invention in human history and the creator would be applauded as a hero of heroes. No one could possibly keep this from the people who needed it. NO ONE. Even if there was some sort of conspiracy against effective treatment, the creator could just leave the US and go to ANY third world country and share his secrets. With the massive influx of people, young and old, rich and poor who would flood in to be cured of their diseases when news broke of MMS’ greatness, whatever country he decided to set up shop in would instantly become the medical superpower of the world. It would be used in hospitals, it would be used within armies, and it would be used by the everyday common person. What MMS would provide to us would be a literal utopia where no one will ever die from an illness again! But it’s not, and it’s dangerous quackery that could easily cause permanent, long term damage to your body from taking it. It’s BLEACH, after all. I’m very concerned for the health of anyone who takes this thinking that it will help them. This can’t possibly cure anyone and it isn’t designed to do anything but make a select few people rich at the expense and misery of others. If you honestly think that good doctors who have to gradually kill their emotions so that they can handle telling an 8 year old child why he won’t survive to see his next birthday would intentionally turn up their noses at something that could save the lives of literally everyone they touch, then you’ve probably been buying into some convenient Conspiracy Theories that help the creator to sell this junk. These theories are advanced intentionally so that people simply shut off intellectually. It’s why there’s no clinical studies for MMS, and it’s why there never, ever will be. Because it doesn’t work. Because the terminal cancer and AIDS/HIV patients I mentioned above would simply die if you exposed them to MMS for too long. You could easily perform any kinds of experiments like the one I mentioned above. Believe me, if MMS was real, I’d be the first person to shout it from the roof tops. But it isn’t, and until you have actual evidence of it’s value, and not second hand claims from it’s creator, you shouldn’t believe anyone who offers to sell you something that could potentially ruin your health just on faith alone. Ask yourself this; What’s more likely, that there’s a massive conspiracy designed to keep MMS from the public’s hands, and for some reason the conspiracy has simply arrested people (not detained them in secret prisons and never let them out, and no assassinations have been carried out) or that it’s just a fraud and it can’t actually cure any diseases at all, and law enforcement is acting against the perpetrators of this fraud by fining them and the like? Which one do you think is more likely to be true? Be honest. Extraordinary claims require extraordinary evidence. MMS makes the claim that it can cure all sorts of diseases, even though it’s just industrial strength bleach, and so the ball is in their court. They have to prove that it works as they say it does. That’s their obligation, not the skeptics, not law enforcement. And so far, they haven’t produced a shred of verifiable evidence proving their case. They’ve just advanced conspiracy theories and shared stories and anecdotes that are impossible to verify the truth of. Now why do you think that is?